Anti-CTLA4–mediated immune-related toxicities in a murine model. 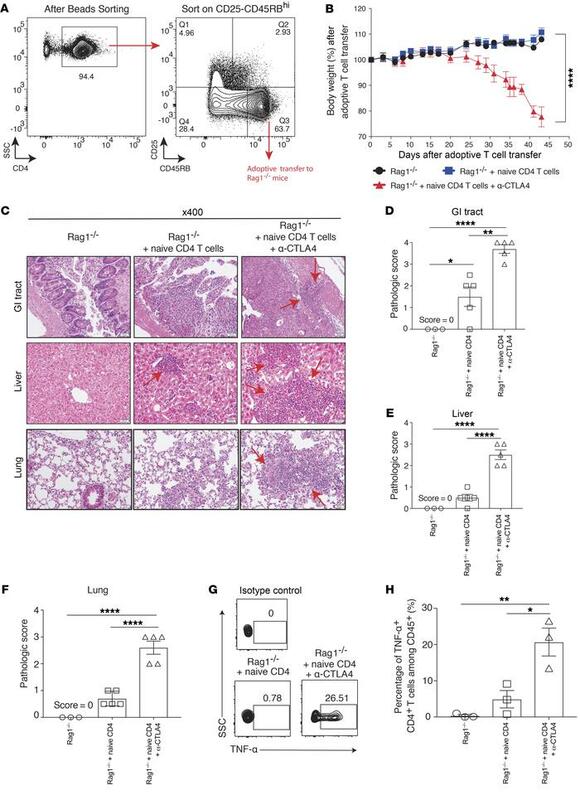 Eight- to ten-week-old male Rag 1–/– mice (on C57BL/6j background) were adoptively transferred with purified CD4+CD25–CD45RBhi cells from WT mice. (A) Sorting strategy. (B) Body weight loss over time after treatment. (C) Different organs were harvested at day 45, and pathological changes were examined using H&E staining under a microscope. Arrows indicate lymphocytic infiltration and pathological changes. (D–F) Target organ pathological scores were evaluated by a board-certified pathologist in a single-blind fashion. (G) Splenocytes were harvested at day 45 from different treatment groups, and CD4+ T cells were examined for TNF-α secretion by flow cytometry. (H) Percentage of TNF-α+CD4+ T cells among CD45+ cells. Experiments were conducted twice, and data were shown with 5 mice per group. Three mice from the Rag1–/– only group were used as negative control. For the TNF-α experiment, data were collected from 3 mice per group. Bars represent mean ± SEM. *P < 0.05; **P < 0.01; ****P < 0.0001, 1-way ANOVA or 2-way ANOVA with post hoc Tukey’s test.